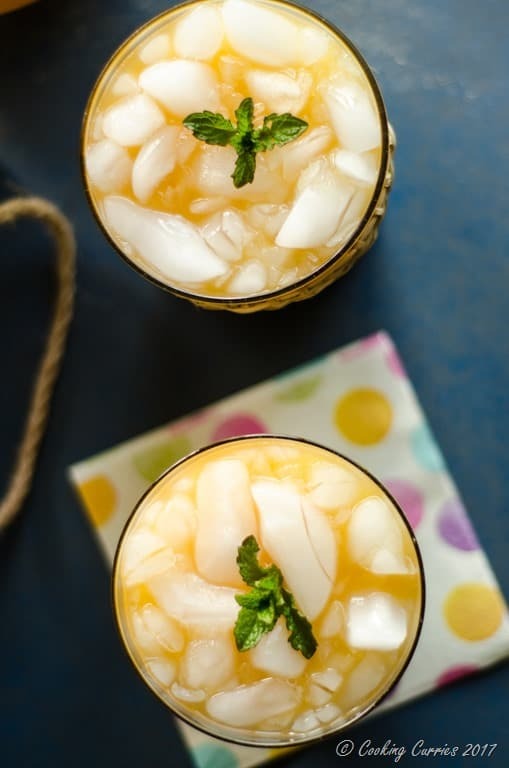 Summer tea parties need something fun too –this Mango Iced Tea Lemonade might just be the answer to that! Well, its official! Summer is here in this part of the world. There are heat waves in the South West and the rest of the country is having its share of hot days too, while us poor souls here in Seattle are just about getting started. At least there is no more rain for a few days at a stretch now.For the bad weather we have been having this year so far, I think that is pretty good. I have been waiting forever for summer to make and enjoy all these delicious summer coolers! 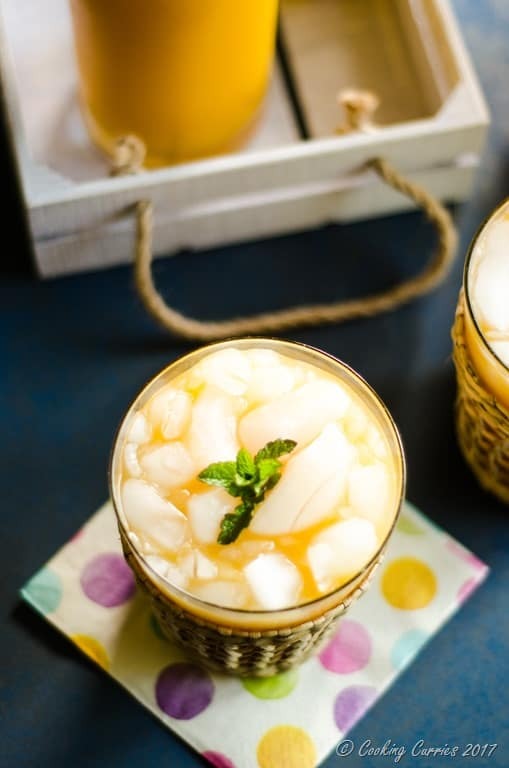 Fresh mango puree and lemon tea in this Mango Iced Tea Lemonade is so perfect for summer afternoon tea parties. 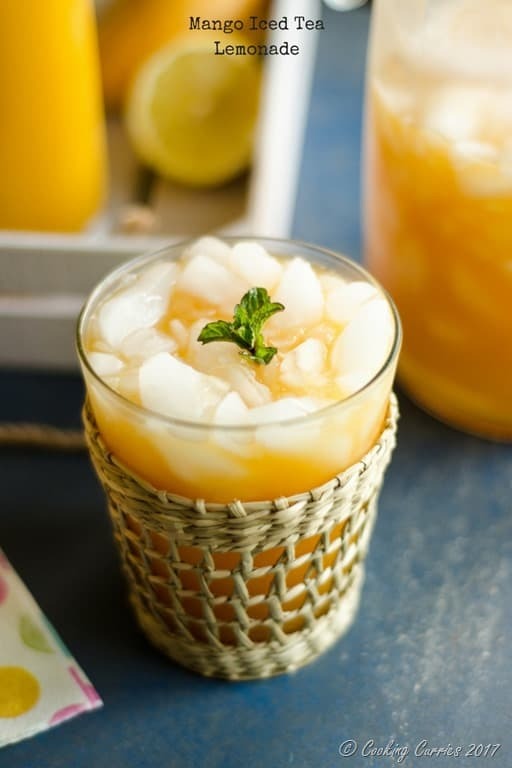 Imagine, sitting out on the lawn, the sun shining brightly, birds chirping and you pour out this chilled Mango Iced Tea Lemonade to your glass, sip and maybe read a book and relax. That is what summers are all about! 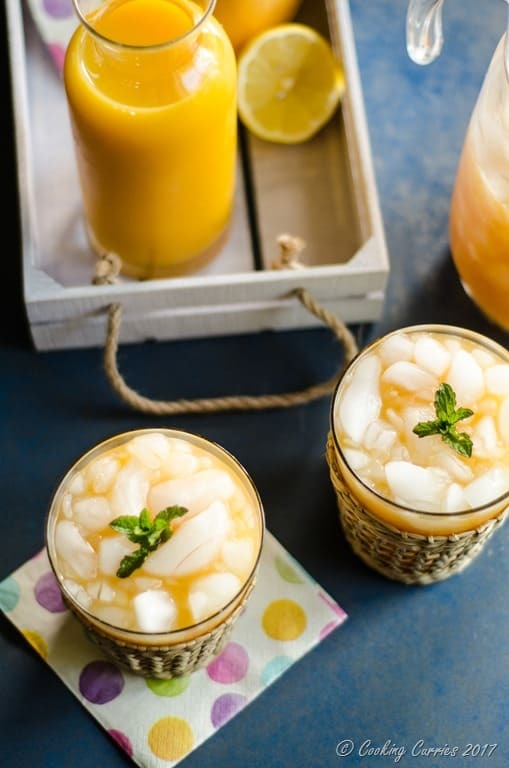 We also love this Peach Lemonade, Watermelon Ginger Masala Lemon Soda or any of this lassi – Saffron Mango Lassi, Minty Peach Lassi and Mixed Berry Rose Lassi to cool off on hot summer days with! Peel and pit the mangoes and puree it. It will be roughly 3 cups of mango puree. Boil the 1 cup of water and steep the lemon tea bags for 5-6 mins. Squeeze the bags out and discard. Let it cool and add to the pureed mango. Add the lemon juice to this and mix well. Pour over crushed ice and mix well again. Refrigerate till ready to serve. Add some honey (optional) for more sweetness and garnish with mint sprigs. I can’t even imagine to make mango iced tea. must try recipe for mango lovers.